Happy 150th anniversary of the second edition of Alice’s Adventures in Wonderland! The second edition? Wait—what about the first edition? 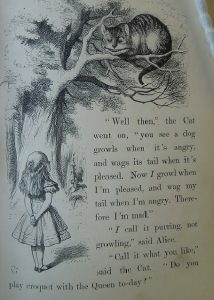 Well, the first edition of Alice, printed in 1865, was suppressed before publication. But don’t get too excited: this isn’t a tale of censorship. It’s a tale of quality control. The 1860s are now sometimes called the golden age of book illustration. Cheap illustration technology was relatively new, and illustrated books were very, very popular. Even fiction for adults was usually illustrated: the first editions of works by Dickens and Thackeray, for example, were full of pictures. In the 1860s, even well-reputed painters like Dante Gabriel Rossetti and John Millais were producing work for books, and the average quality of illustration was higher than ever. Illustration could make or break a title. Alice was illustrated by John Tenniel, a well-known cartoonist for Punch. The first copies were printed in the summer of 1865, and Charles Dodgson (who went by the pseudonym Lewis Carroll) began sending presentation copies to his friends before the official release. 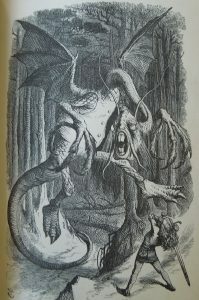 The second edition, published in 1866, was the first to appear in Britain. The pictures in this post are from Edinburgh’s copy of this edition, which is bound with a first edition of Through the Looking-Glass. Hopefully these pictures demonstrate what the fuss was about: these illustrations are spectacular. 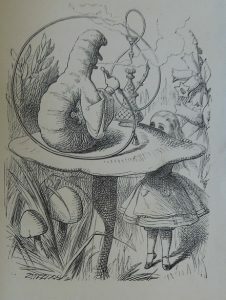 Tenniel did forty-two illustrations for Alice. They were so popular that for Through the Looking-Glass, he did fifty. These pictures brought, and bring, joy to everyone who sees them—except their creator. Tenniel found Dodgson so pernickety and difficult that he almost refused to work on Looking-Glass; it took Dodgson and Macmillan years to convince him. Afterwards, he wrote: ‘with Through the Looking-Glass the faculty of making drawings for book illustration departed from me… I have done nothing in that direction since…’. ** (60). And he never did again. Nevertheless, we’re glad to have these books at Edinburgh. As you can see from these pictures, our copies are in slightly poor condition. But most children’s books are very hard to find in good condition: the children reading them don’t worry about preserving them for future generations. In the case of Alice in Wonderland and Through the Looking-Glass, the binding might be rubbed and the joints might be shaky, but the printing is still impeccable. *That makes them the second issue of the first edition, if you are bibliographically-minded enough to care. The presentation copies that still had the British title page were the first issue of the first edition. Only fifteen are extant. ** Quoted in Sydney Herbert Williams and Falconer Madan. The Lewis Carroll Handbook: being a new version of A handbook of the literature of the Rev. C. L. Dodgson. Revised by Roger Lancelyn Green. London: Oxford University Press, 1962. P. 60. 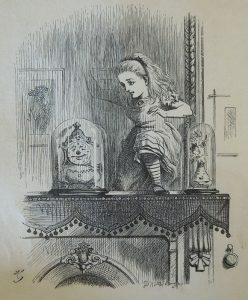 This entry was posted in 19th Century, Rare Books and tagged Alice in Wonderland, book illustration, Children's stories, John Tenniell, Lewis Carroll, printing history by elawrence. Bookmark the permalink.